Me: "What do you see when you look in the mirror?" Me: "But is it really you? There's only one of you! There's no one else like you in all the world. You are an original!" Different 4th grader: "It's your reflection!" Me: "How many of you think it would it be fair to say that your reflection is doing the same thing as you?" Half the class raises their hands. Me: "Or, is your reflection doing the opposite of you?" One third of the class raises their hands. Me: "Or, how many of you think it might be both, the same and the opposite?" One or two hands shoot up, other hands raise and lower tentatively. We work through answering this question in class using our creative dance work. In lieu of this experience here is a video clip for you from the Marx Brothers movie 'Duck Soup' (below). I find this video to be simultaneously fun, highly entertaining, and instructive about the process of reflection. Remember that transformation is essentially about change, and I assert that movement is a particularly effective way to make the process of change visible. Most of the time we are looking into a mirror straight-on. We brush our teeth, wash our faces, or comb our hair, all while looking at our faces and the fronts of our bodies. In this orientation is easy to think that the reflection is doing the same thing as us. But remember, the mirror can reflect all sides of our bodies. As you watch this video you will see Groucho and Harpo directly facing the "mirror" but also walking along the length of the mirror (shoulders to the mirror line) and turning toward and away from the mirror. There's even a fun bit where their bottoms are closer to the mirror than their heads! When is the reflection doing the same thing as the original? When is the reflection doing the opposite of the original? I'll give you a couple examples to get you started. When Groucho first sees his 'reflection' in the 'mirror' they both move in toward the mirror and then away from the mirror. In this case they are doing the same thing. Then, still facing each other, Groucho's right hand goes to his chin, but it is his reflection's left hand that goes up. Both hands go up to the chins, but they are using opposite hands. One more example: At 0:35 Groucho turns away from the mirror over his right shoulder, for a total distance of 180°. Harpo also turns 180°, but over his left shoulder. How many examples of same and opposite can you find? Can you find any mistakes? I had a hard time tracking if they were using opposite rights and lefts in their footwork, for example. Have fun and don't forget to try out some of the activities listed below when you're done watching! How'd you do? Ready for a little application of the concepts? Put a line of tape on the floor. This is your mirror, otherwise known as a line of reflection. Decide who will be the original and who will be the reflection. To start, the reflection has to be the same distance from the mirror line as the original. Move slowly at first so the reflection has a better chance of accuracy. Most important: don't forget to experiment with having different sides of your body be 'reflected' in the mirror. Make up a short piece of choreography with a variety of moves and levels (high, medium and low). In Math in Your Feet, the foot based patterns are units of four steady beats. See if you can make a four- or eight-beat combination of moves using your whole body. Both people practice doing this choreography congruently (everything the same). Then, do the choreography with the line between you. The original needs to move slowly while the reflection figures out what parts of the choreography needs to change (hint: everything is the same except the reflection uses opposite rights and lefts). When you're well-practiced and have it a tempo that both people can do comfortably, show off your work! Perform your choreography with your partner first congruently (everything the same) and then reflected (opposite rights and lefts). If you want a triple challenge, change roles and have the other person become the reflection. Melody Cameron is one of my favorite dancers, and a former teacher of mine. 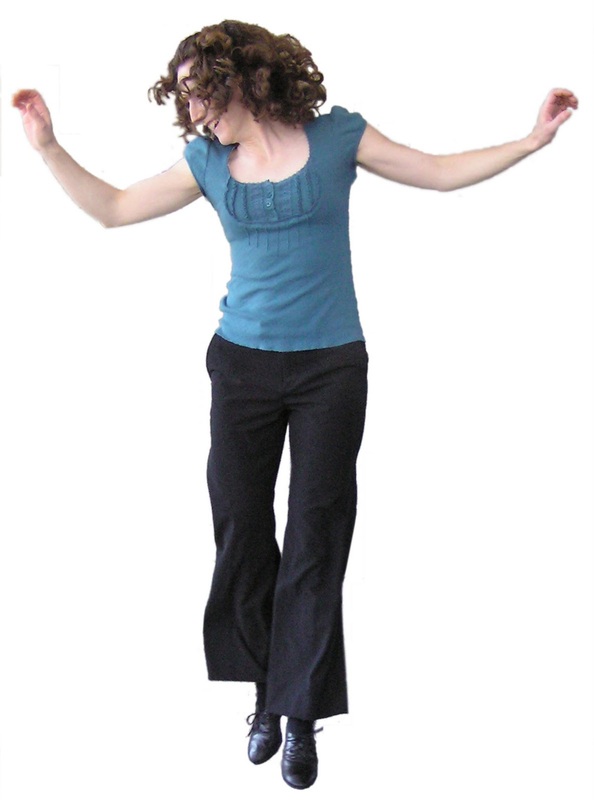 She is from Cape Breton Island, Nova Scotia, Canada and has her own particular, fluid, musical style of Cape Breton step dance. Here she is improvising to a piece of 'mouth music' sung in Scots Gaelic by Joy Dunlop. "Children Think and Learn Through Their Bodies"
Needless to say, as someone who harnesses movement as a teaching and learning tool, I am fascinated every time cognitive science reveals another link between the body and learning, what is often called 'embodied cognition'. 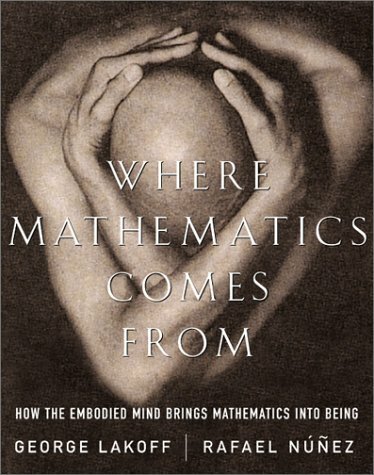 I'm about to embark on a reading of Where Mathematics Comes From: How the Embodied Mind Brings Mathematics into Being, by George Lakoff and Rafael Nunez (thanks to a tip by Michael Paul Goldenberg.) This is a book co-written by a linguist and a psychologist hoping to launch the discipline they would call "the cognitive science of mathematics." In a similar line of inquiry, the researchers who recently published the article Children's Gestures and the Embodied Knowledge of Geometry concluded that "children think and learn through their bodies." "We do not know yet whether gesturing facilitates the development of fluid intelligence or whether it is a by-product. But we do know that children who are asked to gesture in certain ways while learning new tasks learn better than children who are asked not to gesture. Considering that gesturing benefits children while learning, it is possible that gesturing plays a role in the development of fluid intelligence, perhaps by simulating action. If this proves to be true, children might be able to literally give themselves a hand in their own development by gesturing more." My only question is why, with research and thinking like this, many/most schools still insist that keeping kids at their desks, and lengthening the school day behind said desks, is the best way to insure student learning. I know all schools don't think this. I know a lot of really smart folks out there are connecting the dots, but our policies don't reflect the very real evidence that our bodies must be engaged and involved in the learning process. 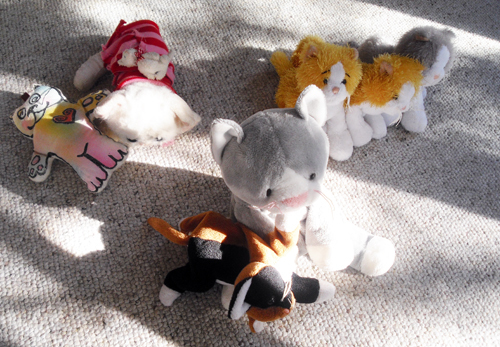 We have a LOT of kitties in our house. And they're all real, too. Most are stuffed, some are ceramic or plastic. Others include a rare bookmark breed and one in a frame. We also have an amazing example of the exotic puzzle breed, one who is an imaginary friend, an actual breathing, chipmunk-catching cat and, finally, one who is a special kind of human cat with white fur and a brown spot on her head. 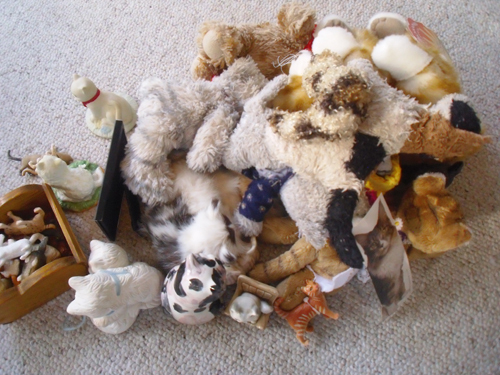 When faced with multitudes like this, a mama's mind turns to math: Just how many kitties do we have and can we remember all of their names? How many different types of kitties are living here? How old are they? Who is related to whom? 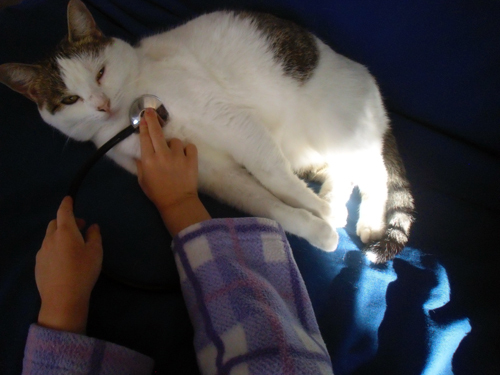 This morning the girl wanted to play vet. I wanted to revisit the Kitty Census we started back in the summer. As with many things, we compromised. ALL the cats went to the vet. I was the intake coordinator. Each cat was registered by name, age, type/description, and malady. Some of the issues included: "a little sad", "lying around, droopy whiskers", "smelly", "bedraggled", "music slows down at end" (that was the music box cat), and "hurt paw". In the end, twenty eight showed up for well visits and eleven had some serious issues. After a triage that took about an hour, we attended to the sickest first. This is the bunch that were there for their well-checkups. We will revisit this data later. For today we were concerned with 'sick' and 'well'. Aventurine, of the rare 'puzzle breed', was assessed at intake as "needs fresh air and run around time without breaking." First, the sick kitties, pictured above, all had a thorough examination, including temperature taking and whisker inspection. Of the group, the Webkins family all had strep, two were afflicted by a 'fever' of undetermined origin, and two needed immediate whisker surgery. Two others, originally thought to be sick ('lying around'), were determined to simply be acting like cats. In the end, I think we simply set the stage for more questions about our brood. I had her chart out the number of sick kitties compared to the well. She was curious about how many kitties there were all together, and initiated a count starting at 28 (well) and counting up the sick column to find the sum total. We'll revisit the intake records and mine it for more data in the near future. How many family groups do we have? How many different breeds and how many in each category? What else do we need to find out about our household of kitties? Until then, one thing's for certain: We've got a whole lotta' kitty loving going on 'round here. will always be an issue, but not insurmountable. Large class size: Taping down fifteen pairs of boxes onto the floor takes some spatial problem solving in limited space, but it is doable. Students do all their work in the little boxes, there is no need to move around. So, if you have the space for the boxes, you've got space for this program. Room size/obstacles: This one got a check mark because there are always going to be issues with room size and obstacles, but they are not insurmountable. One idea that teachers have had is to have kids push their chairs under their desks and tape the squares directly behind their chairs. Behavior management/self control: The rules are clearly laid out -- stay in your square and do whatever you like, except for 360 degree turns on one beat. Because kids are focused on self-initiated work and collaborate with partners, there is always something for them to do, including simply sitting down and taking a break. If things do start going off track, then it's 'group practice time,' time for teams to demo their work, time to add some new math, or even just time to stop. 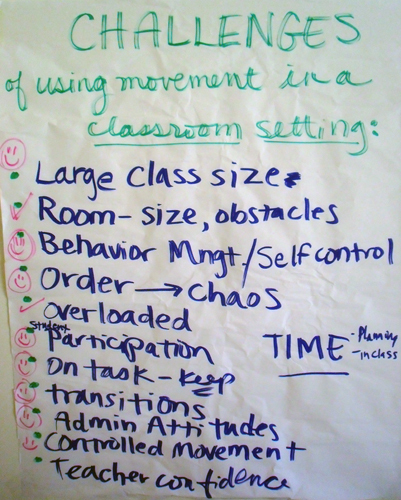 The teachers were initially worried about how to keep order and whether adding movement would lead to chaos. They collectively agreed this would not be a problem using the room layout and my suggested formula of 3-5 minutes of moving, creative work and/or practice, followed by a few minutes of new information or observation, followed by a little more movement, etc. Overloaded kids: This is a really active, often noisy program, but there are regular times where we stop and quiet our bodies. 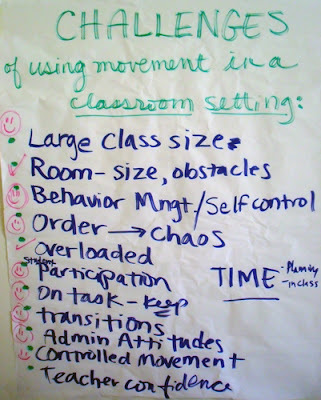 During the workshop I modeled a number of ways for kids to move and maintain self-regulation at the same time; some of this I already knew I was doing, others strategies were pointed out by the participants. I purposefully use my 'count down to silence' to bring us back to a group focus. It ends with smooth quiet movements and voices, by which time we are all on the same page and ready to focus on new information. There are also times I communicate without talking (hand gestures, pointing to words on a poster, etc.) Someone pointed out that everything in my class is really predictable, including the flow of events -- stand/sit, move/quiet, etc. as well as my expectations for staying focused on creative work. This is an on-task program with a creative process broken down into manageable bits, one bit at a time. They were initially worried that not every child would want to participate -- shy kids, kids who are normally disinclined to participate, kids who don't like to move, etc. There are always slow starters, ones who need to observe before jumping in. As long as they don't get in others' way, that's totally okay. There are also always a few teams of kids who never volunteer to show their work. I tell those kids privately that it's okay if they don't want to come up now, but by the end of the week they will be expected to show what they've been working on. Final presentations are never an issue on the last day because of this. A participant noticed that 'everything is a positive' in this program meaning no matter a person's skill level we can always find success. This aids participation because as long as they've moved forward in some way from the first day, mathematically, choreographically or socially, it is time to celebrate! Another big worry was about the attitudes of school administrators: "Why are the students out of their seats?!?" By the end of this workshop the teachers said that all you need to do is show the list of vocabulary and concepts used in this program to those who might doubt the value of such an approach to illustrate the relevant learning happening while the kids are moving. The teachers in this particular workshop had between eight and 37 years of full-time teaching experience. What I love is that, based on evaluations, they all found this three-hour workshop to be a positive learning experience and that the ideas presented would be useful in their teaching. ...and I nearly missed it. Just this week I was thinking, "Gee, I think I've been blogging for about a year now. I should go back and check the date." I remembered just now, and good thing, too. It's been exactly a year today since my first post. 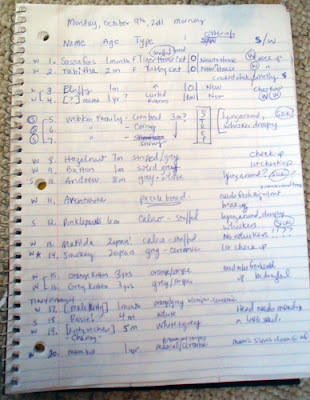 I had just submitted my article for peer review to the Teaching Artist Journal and felt I had more to write. And write I did. When I started I didn't really know if anyone would read this blog; I haven't had a ton of readers, compared to other blogs, but am so grateful for the folks who have subscribed, followed, checked in, and commented. This blog has been a chance for me to illustrate and explain my work integrating percussive dance with elementary math topics, describe my work as a teaching artist more fully, and make connections between math, dance, and other similarly creative pursuits. It's not really all over the 'map' but I do recognize that this might be categorized as a 'multi-topic' blog. That's fine with me -- I enjoy having multiple interests that intersect in sometimes fascinating ways over time. This space has also been a way for me to connect with really interesting and smart folks in the mathed world, folks who have been really patient with me as I ask questions, share my ideas and generally expand my understanding of math thinking, topics and practices. Sue VanHattum at Math Mama Writes, Maria Droujkova of Natural Math, Julie at Living Math, and Bon Crowder at MathFour have all provided wonderful support, forums, and conversations as I explore the world of math education. It's been a whole year, but I feel like I'm just getting started. I see a lot of geometry in origami but have always wondered what other math you can find in this kind of paper folding. Origami has the same values as mathematics, such as precision, modular reasoning (“bird base” as a group of folds), attention to detail, modeling, algorithmic thinking… Thus origami can be used to support math values in a rich context. The same goes for music. I love the idea of supporting math values 'in a rich context.' I love even just the idea of a 'rich context.' I think all learning should happen in such a place. Onward. 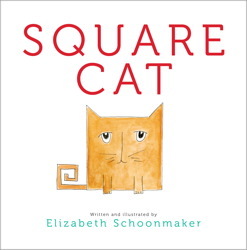 Over at love2learn2day there's a fun giveaway of the book Square Cat, by Elizabeth Shoonmaker. You can find a review and lesson plan of the book there as well. Check back soon for the results from the KITTY CENSUS. 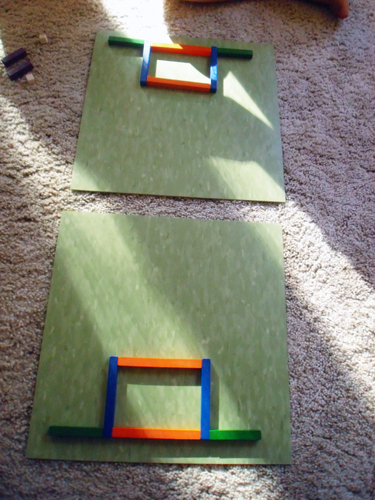 In trying to capitalize on the kid's penchant for 'talking math' I recently decided to try a game with her that I found in the booklet that came with our set of Cuisenaire Rods. The game is called Build What I Have. One person describes a design they are making with their rods and others try and reproduce that design by listening closely. One of the main points in this game is to introduce and/or reinforce math vocabulary. The suggested age range for this activity is 2nd-8th grade; even though the kid is a young six I knew we could still get something out of it. 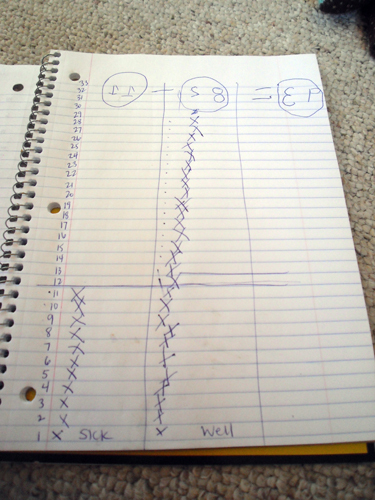 I decided that, to start, I would capitalize on concepts she already knew (parallel, points, edges, top, bottom, sides, etc.) and introduce some new ideas (perpendicular, horizontal, vertical). The rest we'd muddle through somehow, I figured, but she did surprise me by knowing her lefts and rights. "We've been doing that in ballet class, Mama," she stated mater-of-factly. Fabulous. 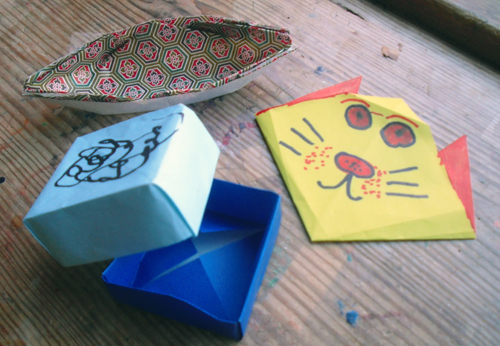 To start, we hid our designs from each other. This is the first design. I led and she followed, trying to make her design match mine by following my instructions. I started by saying: "Lay your blue rod parallel to the bottom of our work surface." She already knows the concept of parallel really well, often times finding and noting examples of parallel lines when we are out and about. "Then," I continued, "take your green rod and place in perpendicular [holding the rod in the air] up and down like this, and place the end in the middle of the blue rod." Success! Our designs matched! This is the game she led. To start she told me to put my orange rod parallel to the bottom of the workspace, but about an inch up. The second orange rod was to be 'a couple' inches above the first one, but when she told me to put the blue rods on the sides to 'make a rectangle' I clarified the distance. "Looks more like three or four inches, to me," I said. I asked her to clarify the placement of the blue rods -- do they go on the outside ends of the orange rods, or inside? Notice that this design is mostly made up of parallel lines, a concept she is most familiar with. This is the second design I led. I said, "Take your three light green rods and put them so they are together and vertical, up and down, in your workspace...Oh look! They make a nice little cube!" At first she thought she needed a fourth one to make it a square, but I clarified and said we're not making the outline of a square, but a solid shape. When we revealed our designs to each other we saw some differences! This is how she recreated my instructions. 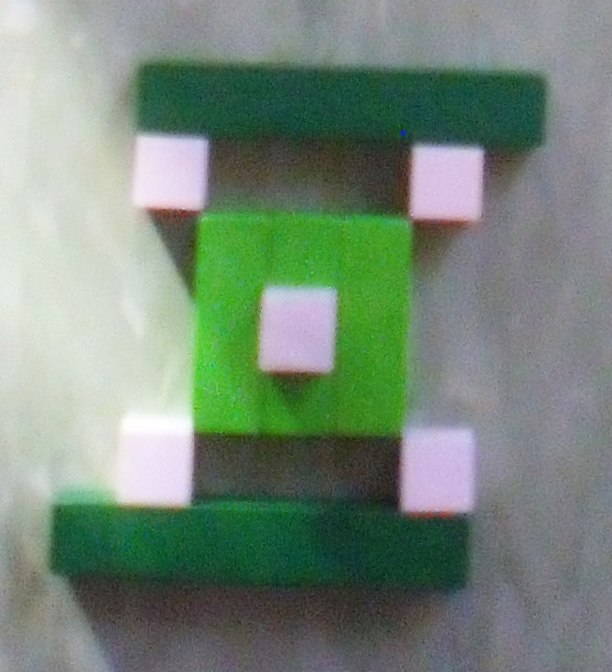 The white cubes are essentially in the right areas, but I had actually challenged her to put each white block 'point to point' with each corner of the light green square. 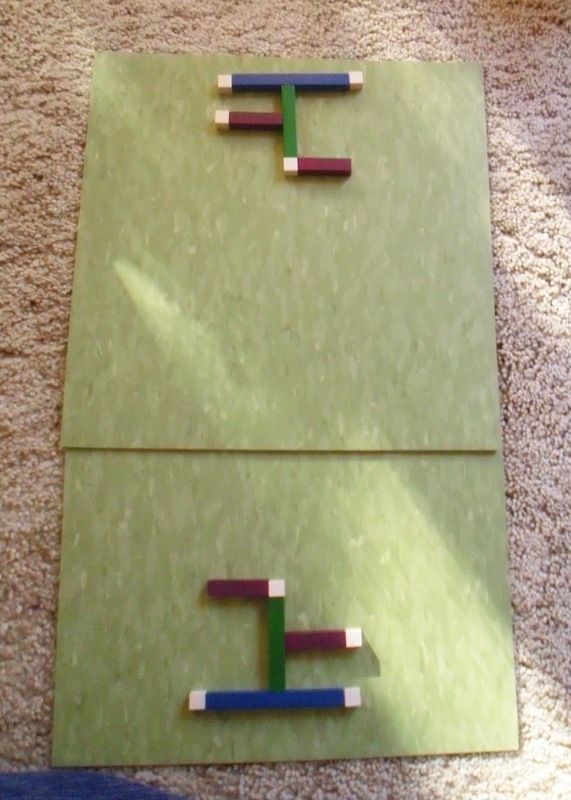 The dark green rods are essentially in the correct place; I knew that was somewhat complicated to execute. 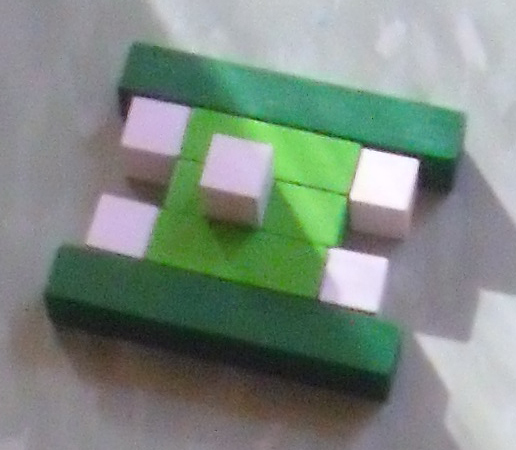 And, I just noticed, the light green rods are horizontal, not vertical. This is the last design in our session, which she led. Perfect! She wanted to use a bunch of different rods, but everything is still parallel here. My daughter's designs were much simpler today than normal and I think it might be because she had to describe what she was doing as she built them. There is an equivalent experience that I find to be true in my work with 4th and 5th graders as well. Often times I tell those kids that they are doing complex mathematics in their bodies and grade-level math on the page; they understand more math in their bodies than they can communicate through words or symbols. Sometimes it is impossible for them to notate their Jump Patterns because they are just too complex for their current stage of symbolic mastery. Often kids can do, know, and understand way more than they can communicate symbolically. 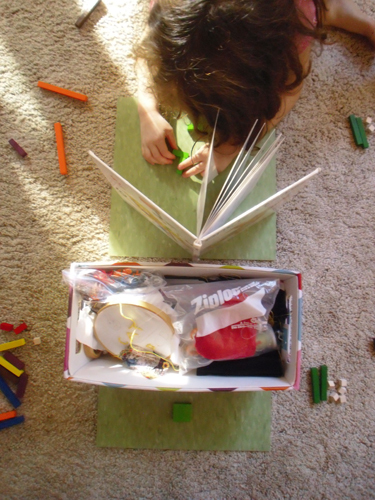 If we only judge a kid by her output on paper, we're not really seeing the whole child. There are many ways represent comprehension: we need to listen and watch carefully for other indications of understanding as well. It wasn't too long ago when I brought the word 'parallel' into my daughter's universe. It will be exciting to observe her body and conversations show me she's 'got' the concepts of perpendicular, horizontal and vertical. Being able to use math terminology freely and appropriately is a big goal in elementary math education. In my opinion, there's no way you can really use math vocabulary intelligently unless you've first had a chance to experience the concepts in a concrete manner. This is a huge part of what happens during a Math in Your Feet residency -- I am never surprised when an astonished teacher tells me: "I can't believe how easily they're talking about math!" It would not be an exaggeration to say that most of us need to do math with our bodies in some way before we can talk about it. Much of the math my daughter and I do together is hands-on and verbal; as a learner, she is best served by conversation. We'll be in the car on the way to somewhere and she'll spurt out some new computation she's been working on in her head and with her fingers. She may only be working with numbers one through twenty but, based on the frequency and variety of these kinds interchanges, she seems to be going pretty deep into her questioning. 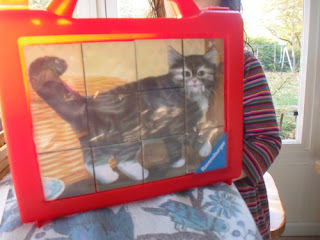 "My daughter is telling me all the different ways she can 'make ten'," I wrote, "what's that called in math language? You know, 2+8, 6+4, 9+1...?" 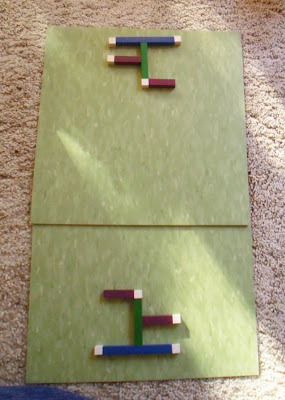 "These are called 'number friends' by elementary teachers. 10 is important as the base of our number system. She is playing with a newly-discovered idea of an 'equivalence class.' You can try it with other things. For example, numbers whose difference is her favorite number (10, 2, whatever) - like 15-5 or 12-2 or 99-89. It's a road to ratio and proportion, too - which come up a lot in music signatures and dance!" Thanks to Maria, it appears my daughter and I will have a lot more to talk about, well in to the future! There are other ways we are talking math these days, as well. You can find out more in Conversational Math: Part Two.